We love potatoes, all of us, in my house. We have Idaho roots, so how could we not? 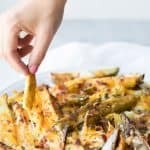 One of our favorite potato sides to make are these CHEESY POTATO FRIES but they can take a while to make. Potatoes take a long time to bake! and when you don’t have an hour to make dinner you turn to your instant pot. One sunday I tried a variation of these cheesy potato fries using the pressure cooker and it worked PERFECTLY. 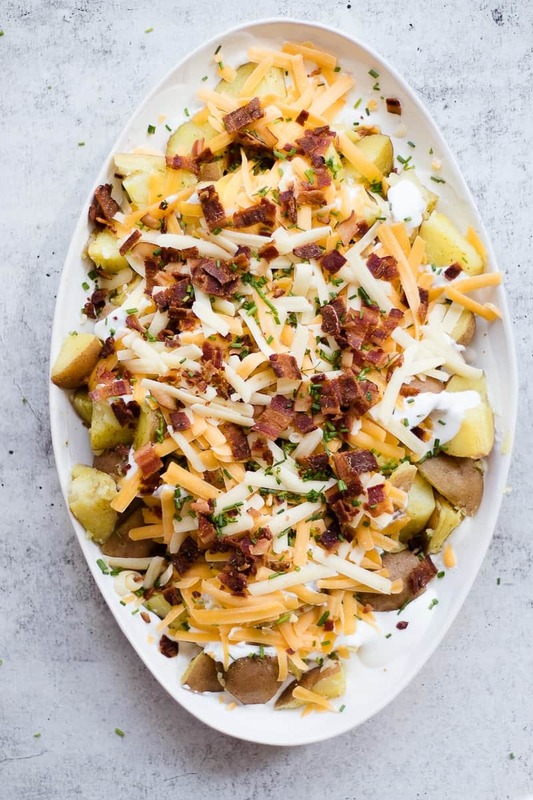 This pressure cooker cheesy potatoes recipe need to be on your menu THIS WEEK! Pressure cooking potatoes in my instant pot has become my go to way of cooking potatoes. Last night we made mashed potatoes! They all are so easy and go like this. wash and cut potatoes into large bite size pieces. While the potatoes are cooking I make up the creamy sauce. This is pretty key to this dish. A little bit of sour cream, ranch and milk! Use about 3/4ths of it and spread it all over your platter. 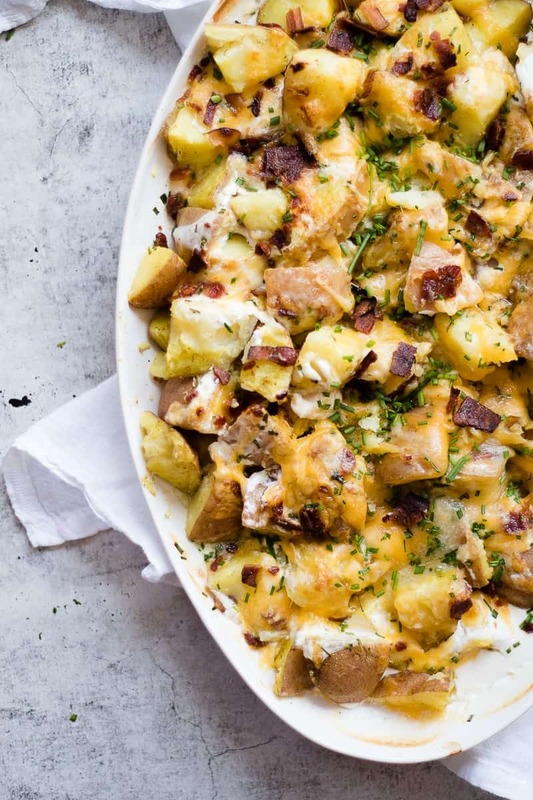 Pile on potatoes, remaining sauce, cheese (SO MUCH CHEESE) bacon and chives! 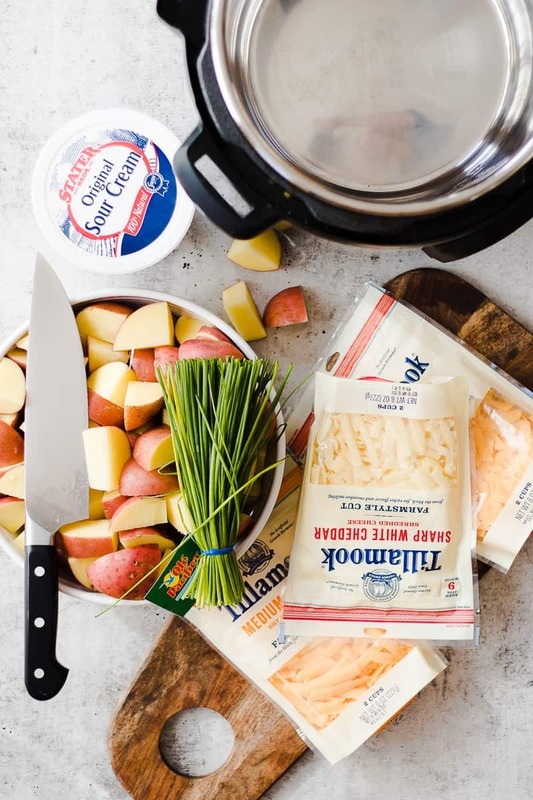 I love how you can see everything in this photo… and this farm style tillamook cheese is pretty bomb! Since the potatoes just came out of the pressure cooker they don’t need to bake, but the cheese needs to meit! Throw the cheesy potatoes under the broiler and they’re done!! See it was so quick and easy. 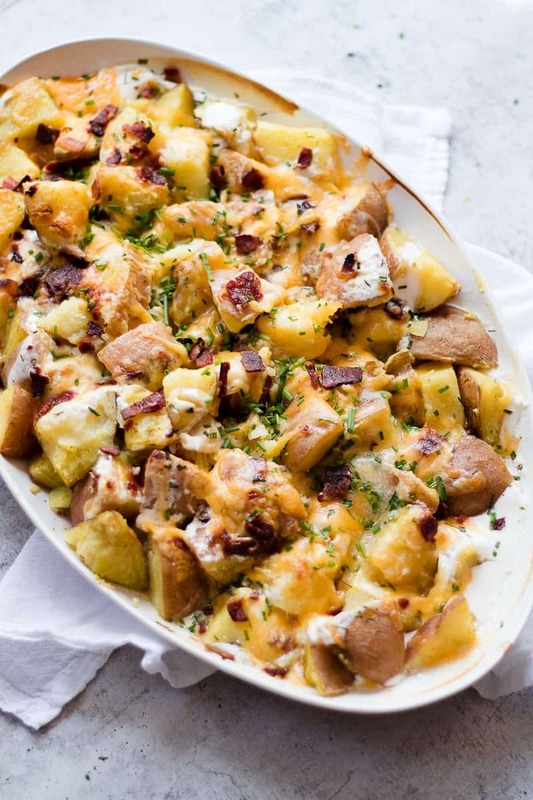 This cheesy potatoes recipe is always a huge crowd pleaser too. Besides making them for a our family dinner i also love to make them for parties, tailgate, extended family holiday parties. Everyone loves them. The platter is licked clean. 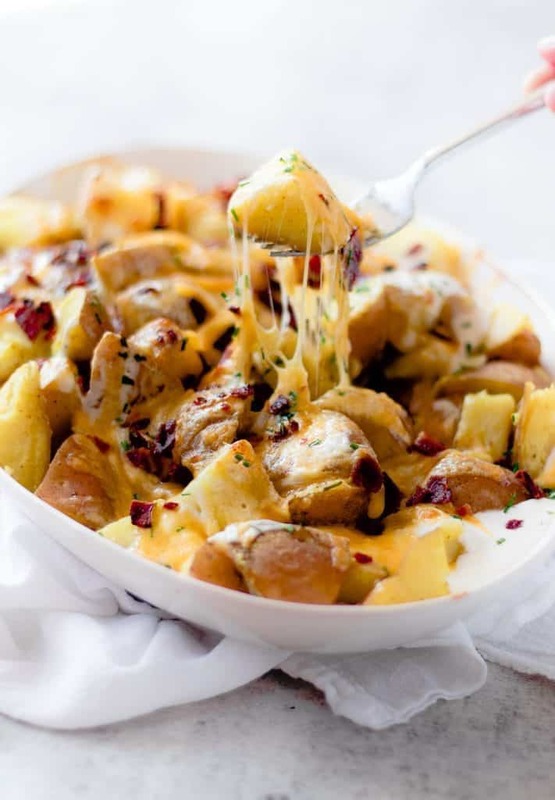 If you tried this Cheesy Potatoes Recipe or any other recipe on the blog then don’t forget to rate the recipe and leave us a comment below. You can also follow us on Facebook, Twitter, Instagram and Pinterest to see what else we’re getting up to! 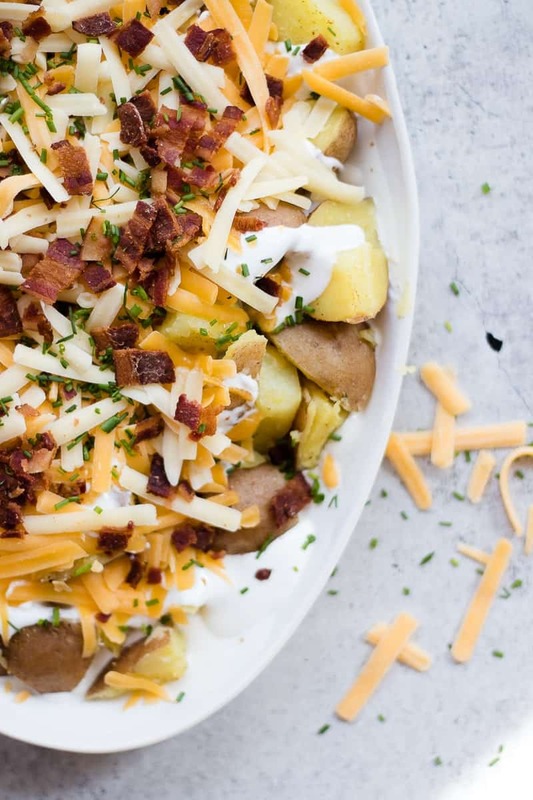 The best potato dish you will ever eat now done in half the time by using the instant pot; popular Los Angeles food blogger Oh So Delicioso shares her delicious Pressure Cooker Cheesy Potatoes Recipe. Click here now for the instructions! Place in pressure cooker with broth and salt. Cook manual high 4 min. Immediately Quick release when done. DO NOT SLOW RELEASE/NATURAL RELEASE potatoes they will be too soft. When done drain any excess water. 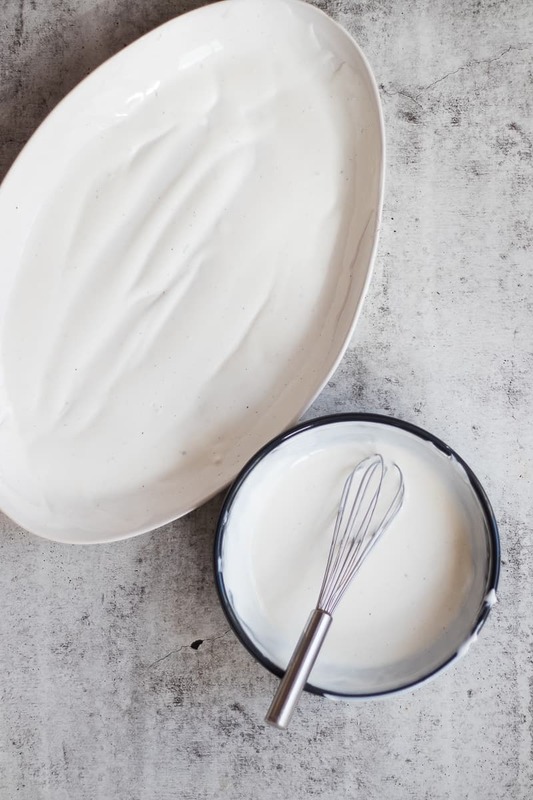 in separate bowl mix ranch, sour cream and milk. Smooth 3/4th of the sauce on the platter. Add remaining ranch sauce, cheese, bacon and chives. Broil for 2 minutes until cheese in melted.